52 Lac (Negotiable) 4279.84 per Sq. Ft.
55 Lac (Negotiable) 5522.09 per Sq. Ft.
66 Lac (Negotiable) 3626.37 per Sq. Ft.
55 Lac (Negotiable) 4400 per Sq. Ft.
2 BHK Residential Apartment for Sale in Elamakkara Ground floor with 700 sqft garden* *Fully Furnished* with mosquito curtains: & shaded window glasses ▪9 fl..
4.75 Cr (Negotiable) 8699.63 per Sq. 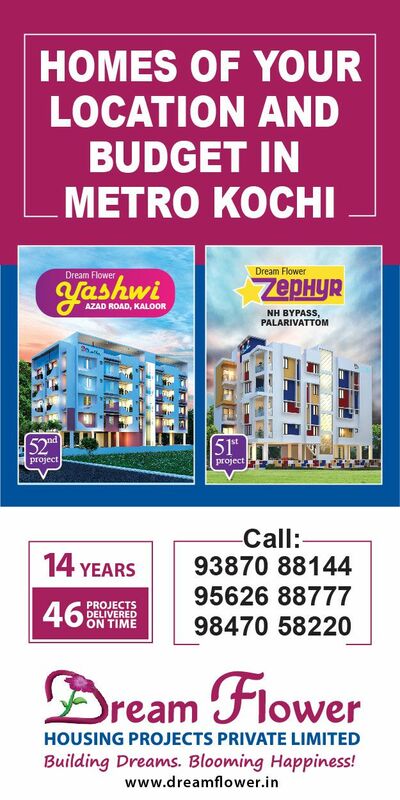 Ft.
4 BHK Residential Apartment for Sale in Vyttila. 5460 Sq Ft 4 BHK Duplex Flat for Sale in Chilavannur 18th &19th Floor. 58 Lac (Negotiable) 4233.58 per Sq. Ft. Apartment is g+3. 6 year old flat. 3bhk + 3 bathrooms. Furnished apartment with wardrobe and kitchen cabinets. Amenities include 24 hrs security , automatic lift ,..
A lush boulevard of rubber trees makes for a grand entrance to Rainwoods.A quick getaway from the chaos of the city, while being close to everything you can think ..